Location, Location! 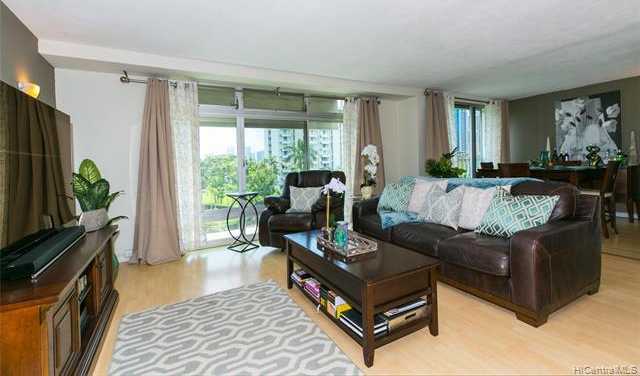 Own a piece of paradise at Queen Emma Gardens nestled in the heart of downtown. This resort style condominium offers an array of amenities. Take a stroll through the 8 acre garden setting featuring 2 pools, BBQ pits, playground, walking/jogging paths, koi ponds, and 2 Japanese style tea houses. Then relax in this 2 bedroom 1 bath unit with an enclosed lanai which offers more square footage than the average 2 bedroom unit here. The convenient location is within walking distance to shopping, dining, and entertainment and there is close access to the H1 freeway. Don’t wait, see for yourself all that this unit has to offer! Please, send me more information on this property: MLS# 201910612 – $448,000 – 1519 Nuuanu Avenue Unit 341, Honolulu, HI 96817. I would like to schedule a private showing for this property: MLS# 201910612 – $448,000 – 1519 Nuuanu Avenue Unit 341, Honolulu, HI 96817.